My latest fun has been with soapstone and alabaster. 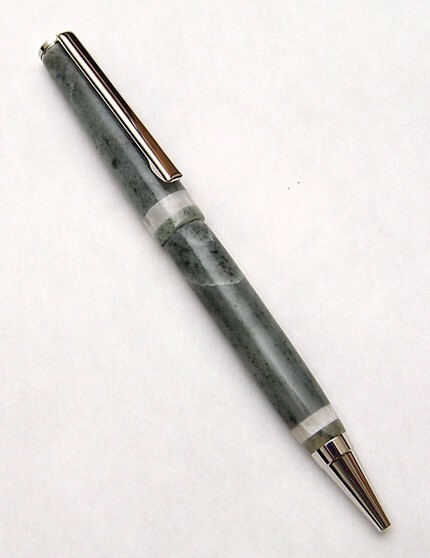 This pen to the left is made from green soapstone with white alabaster trim on a rhodium slim kit. It was done as part of a no-saw challenge over at IAP. Alabaster cracks. A lot. No matter what you do. So let it! Use it as a design element! Use a glue that fills the gap between the brass tubes and the stone. CA doesn't cut it, nor does epoxy. JBWeld will to some extent, but Gorilla Glue (or Sumo or whatever) expands as it cures. This is perfect as it fills all the gaps and holds the stone even when cracked. Your scraper and your skew are your best friends. Gentle light cuts are needed, especially with alabaster. Soapstone is softer and less brittle so you can be more aggressive. Wear breathing protection!!! The dust from these is VERY fine. A respirator is best. A strong fan blowing across the lathe and out the open garage door works too, but you still need at least a dust mask. Finish if you like. I triple buff instead, finishing with a nice carnauba wax. Some folks apply a CA finish. That second pen is strictly white alabaster on a black Ti Jr Gent. See how the cracks run throughout. But the material is solidly attached thanks to the Gorilla glue. This is great stuff to work with, I suggest picking up some pieces and seeing what you can do! That second photo is outstanding! 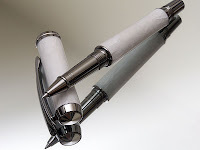 I like the pen very much too. Very inspirational thanks for sharing it.